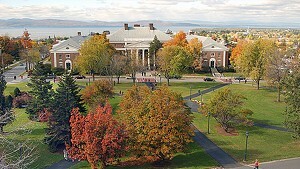 Cresting the hill at the top of Main Street, visitors to Burlington come upon the University of Vermont's manicured green and the fine old buildings lining its eastern edge. Dead ahead, Lake Champlain and the Adirondacks present a beckoning vista. Proceeding toward downtown, motorists and pedestrians pass well-preserved mansions on both sides of the city's main artery. And then, on the threshold of Burlington's commercial center, they encounter what officials refer to as the Welcome Block. Which is not welcoming at all. Opposite a gas station and convenience store is a 42-space parking lot, a derelict motel and the dilapidated and soon-to-be-shuttered Memorial Auditorium. Taggers have already sprayed tombstone inscriptions on Memorial, the 89-year-old city-owned civic center that once rang with cheers during Champlain College basketball games, wrestling matches and concerts by stars from Bob Dylan to Bob Marley. Today, anyone entering the erstwhile entertainment center hears only the sounds of silence. Burlington City Arts' pottery studio remains in operation on the ground floor, but, like the 242 Main teen club and the Generator maker space, it must be gone by year's end. Structural deficiencies have been neglected for so long that the brick building is now officially unusable. Signs of decay are everywhere: Cracks fracture stairways; water stains blotch the ceiling above the basketball court; weeds sprout on the steps of a Main Street entryway blocked with plywood. In the South Union Street lobby, crowds no longer read names off the 10 bronze plaques that list scores of Burlingtonians who died in foreign wars. 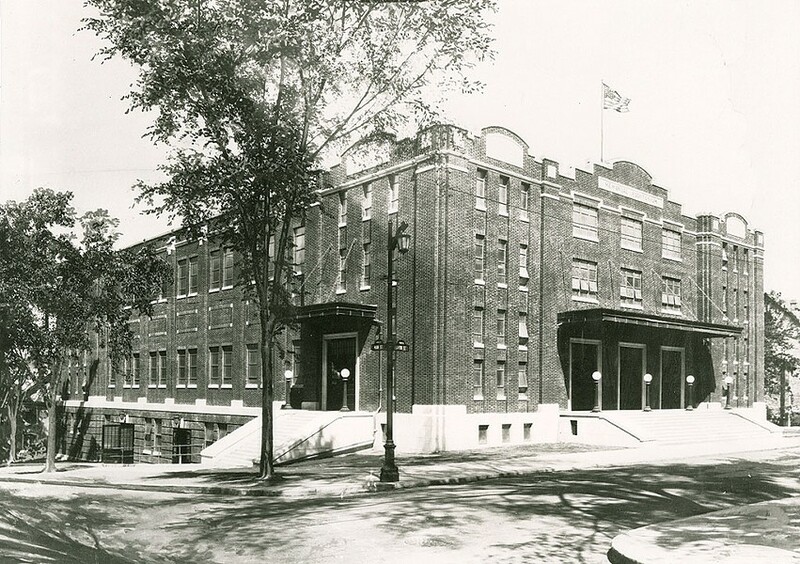 For many of those vets, Memorial Auditorium was the Queen City venue, long before the Flynn Center for the Performing Arts, Higher Ground or ArtsRiot existed. Today it's "a multipurpose building with no purpose," lamented Jesse Bridges, director of the city's Parks, Recreation & Waterfront, which manages Memorial. His assessment leads cynics to wonder: Could Memorial become the next Moran Plant, the city's former electric generating station, which sits largely moribund and graffiti-covered on the Burlington waterfront 30 years after it shut down? City officials insist that scenario will never come to pass. "There is no way this council lets Memorial or the entire Welcome Block continue to be underutilized," declared City Council President Jane Knodell (P-Central District). "There's no way I see Memorial sitting abandoned for years and years." Mayor Miro Weinberger is equally adamant that the civic auditorium will not become Moran on Main Street. "Moran has a unique set of challenges," he said. "It's geographically isolated, has significant environmental problems and has constitutional issues regarding the relatively limited number of uses for that building on filled land. Memorial doesn't face any of those obstacles." By early next year, the Democratic mayor vowed last week, he will present the Burlington City Council with a plan for the future of Memorial Auditorium. 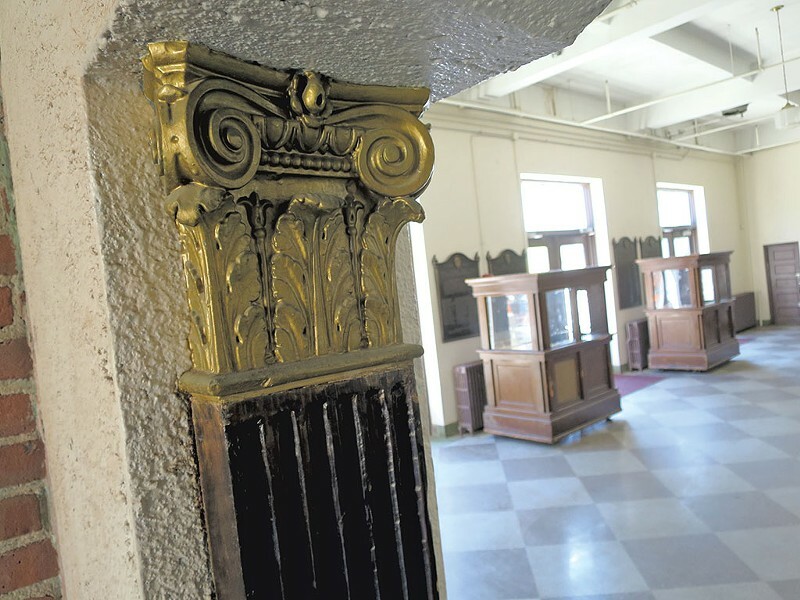 Last year, the Weinberger administration hired Vergennes-based real estate planner Jeffrey Glassberg to study options for the site and prepare a request for proposals to rebuild or replace Memorial Auditorium. He wound up in talks with UVM, which has been weighing the possibility of building a $60 million, 4,500-seat arena on the entire stretch of the Welcome Block that fronts Main Street between South Winooski Avenue and South Union Street. The university is also considering South Burlington, with its ample acreage for parking, as the site for the envisioned hockey and basketball arena. 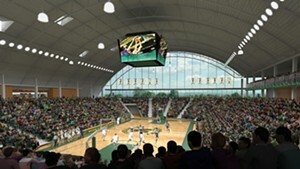 Alternately, said Tom Gustafson, a UVM vice president, the school could choose to upgrade and expand its existing Gutterson Field House and Patrick Gymnasium. Glassberg is performing due diligence on the UVM arena plan until November, at which point the city will issue the long-awaited request for proposals. The hope is that it will attract private development or financing partners for either the arena or some alternate plan. Bridges assured, "If the arena doesn't pan out, if the RFP doesn't pan out, we'll find a way to do renovations." But simply bringing Memorial up to code — that is, making it safe to be inside the place — would cost an estimated $4 million. The price of modernizing it to accommodate shows in the 2020s and beyond runs as high as $17 million. The city isn't keen on making such outlays on its own, which leads the mayor and other officials to emphasize the need for a public-private partnership in regard to any future use of the building, or its footprint. That includes a UVM arena. "There's no example in the country of a facility like that paying for itself," Weinberger said. "The arena is not going to happen with only the city and the university making significant investments or capital reinvestments in that site." A $4 million Memorial makeover — if the money to do so were somehow to be found — doesn't appeal to independent Councilor Adam Roof, who represents Ward 8, where the building is located. "I'm not sure I see the point of spending a lot to repair it when there would have to be more repairs in 20, maybe 30 years," Roof said. Burlington's history of grassroots resistance to major redevelopments suggests that a teardown might not be popular, either. "People would go crazy," predicted Alan Abair, who managed Memorial from the early 1980s to the mid-1990s. Local ordinances would require public hearings in the case of proposed demolition, said Noelle MacKay, director of the city's Community and Economic Development Office. She also noted it's listed on the national and state registers of historic places, meaning development or demolition projects involving it could be subject to federal, state and local review, depending on the plan and funding sources. Abair argues that a fixed-up Memorial Auditorium could be a civic asset for many years to come. "There's nothing wrong with its basic construction," he said, likening the auditorium to the mills of Winooski that still stand, in repurposed forms, more than a century and a half after they were built. Rehabbing the building is "absolutely worth it," in Abair's estimation. "It was built to honor vets," he pointed out. Who's to blame for the sorry state of a building that Burlington's then-mayor C.H. Beecher extolled in 1928 as "the largest and best-equipped auditorium in New England north of Springfield, Mass."? There's no single villain in this saga of neglect. Concerts featuring rock stars became less frequent as the costs of performing there rose steadily, Bridges noted, and better-equipped venues opened in the area. The building lacks an elevator, which "makes the load-in very complicated," he said. "The city only charges $2,500 to rent the hall, but it can cost $25,000 to put on a show in Memorial." Entropy is probably the main force behind the building's decline. City authorities did little or nothing to counter the effects of time and climate. As early as April 1981 — one month after Bernie Sanders' epochal election as mayor — Burlington's building inspector warned that Memorial was out of compliance with the national building code because of a leaky roof and other problems. Sanders did make repairs during his eight years in office, Abair recalled. 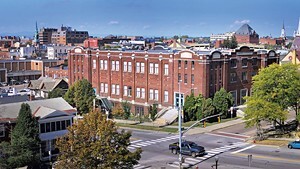 The progressive mayor also worked to make the building a key venue in the city's arts scene, the former manager added, recalling that Memorial hosted many concerts in the '80s and '90s that were too big or disruptive for the smaller, sit-down Flynn. By 1991, however, city officials knew the building needed substantial repairs. Martha Keenan, capital improvement program manager at the Department of Public Works, told the city council last year that a rehab priority list prepared by an architect in 1991 included many problems that remained unaddressed a quarter century later. "Stantec engineering performed a facilities assessment in 2008 that itemized significant needs at that time," Keenan added in a memo. "There were some masonry repairs and some ADA improvements completed at that time, leaving a multitude of items deferred." That same year, more than 50 percent of Burlington voters said yes to a ballot item that would have authorized the city to borrow up to $8 million to repair Memorial Auditorium. But the initiative required a two-thirds majority, so it failed. By then, Bob Kiss was two-thirds of the way through his first term as mayor of Burlington. City Councilor Dave Hartnett (I-North District) said that in his earlier role as chair of the city's parks commission, he urged the Kiss administration to develop both a short- and long-term plan for Memorial. "We were told that wasn't a priority," Hartnett recounted. During Kiss' second term, which ended in 2012, Hartnett said efforts to salvage the nearly insolvent Burlington Telecom monopolized the mayor's attention. "A lot of things were neglected during that time period," he observed. The current mayor is diplomatic when asked who should be held responsible for the state of Memorial. "Prior administrations, all made up of hardworking people, faced large sets of challenges that needed to be managed and juggled," Weinberger said. His own administration has almost finished clearing obstacles that held up progress on capital needs, Weinberger added. Those include the stabilization of Burlington Telecom, reform of the city's pension plan and infrastructure improvements on the northern waterfront. Memorial Auditorium, he said, "is coming into focus as one of my top priorities." Hartnett agreed that Team Weinberger is likely to move the ball forward. "The mayor takes a lot of knocks for his building projects, but Burlington is now really on the 'go' button," the councilor said. "We're getting a lot of stuff done." So will Memorial be renovated or redeveloped within the next five years, ensuring it doesn't become the next Moran? Correction, October 18, 2016: Memorial Auditorium is listed on the state and national registers of historic places. An earlier version of this story contained an error. After Years Of Neglect, Burlington’s Memorial Auditorium Is Falling Apart. Can Anyone Fix It?